Running With Claire at the Baltimore Running Festival!! I just love this photo! 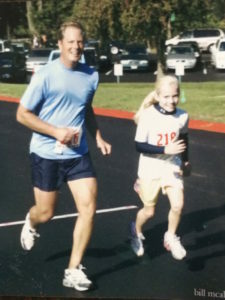 Rocky and Claire, Daddy-Daughter, running her first 5K. She was in first grade and so proud! All smiles with her blond ponytail bouncing all the way to the finish line! 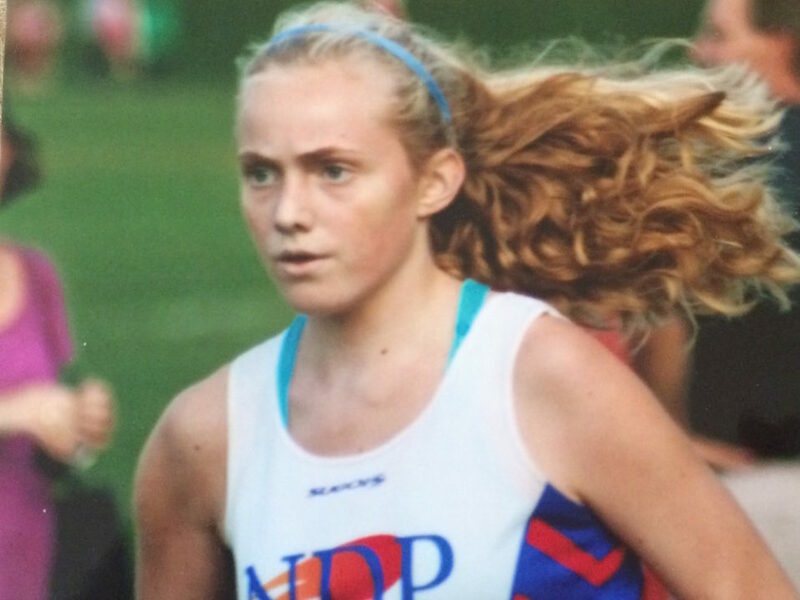 Long after she was forced to give up lacrosse and field hockey due to the intensity of her melanoma treatments, Claire continued to run. Be it on her school’s cross country team or as part of her determination to stay fit while fighting the “beast” – she would lace up her shoes, grab her head phones and head out the door, running to clear her mind and fill her heart. It was a bond she shared with her dad. Rocky spent many years as a marathon runner – competing in the Baltimore Marathon numerous times as well as the Marine Corps Marathon. Claire was still in her stroller as Hillary and I pushed her along the running route to cheer him on! Although Rocky now cycles – case in point, his 630 mile Riding With Claire journey in 2015 – he was always hopeful that running was something he and Claire could do together in the years to come. Now they are, but it’s not quite as he imagined. The Claire Marie Foundation is an official charity of the Baltimore Running Fest; one of the premiere running events on the East Coast! We are over the moon at the thought of incorporating Claire’s love of fitness with our campaign to raise awareness, clarity and hope in fighting adolescent and young adult melanoma. Rocky’s got his Relay Team set! Why don’t you join us! It’s October 21, 2017! Pick a race; 5K, Half Marathon, Marathon, Team Relay or even the Kid’s Run! We pay your registration fee and you help us raise funds to fight melanoma in young people. It’s that simple! Just email us at [email protected] and we’ll get you signed right up! All you need to do is lace up your running shoes, get your friends to support your efforts, and have a blast while running to support our cause!! Are you inspired to raise more than the minimum dollars? Yes please! We’d love it! After all event expenses are covered, 100% of additional funds will support our mission to raise awareness, clarity, and hope in the fight against adolescent melanoma. • For the top Individual fundraiser (5k, Half Marathon or Full Marathon) – $1,000 travel voucher on Southwest Airlines. • For the top Relay Team Fundraiser – $2,000 travel voucher on Southwest Airlines. How amazing is that? Running to save young lives on a fabulous fall day! A terrific way to #LiveLifeLikeClaire! Pediatricians and General Practitioners do not routinely study dermatology in their medical preparation. Surprise! Basically that means they are not trained to detect skin cancer and melanoma at it’s earliest point of origin. That is why it is essential to schedule an annual full body skin screening with a qualified dermatologist. But before you book your neighbor’s favorite derm, listen to this: not all dermatologists are equally trained either. Some specialize more in the aesthetic and cosmetic care of the skin. Others offer greater attention to the disease aspects of the skin. Then there are those who are equally balanced in both specialties. 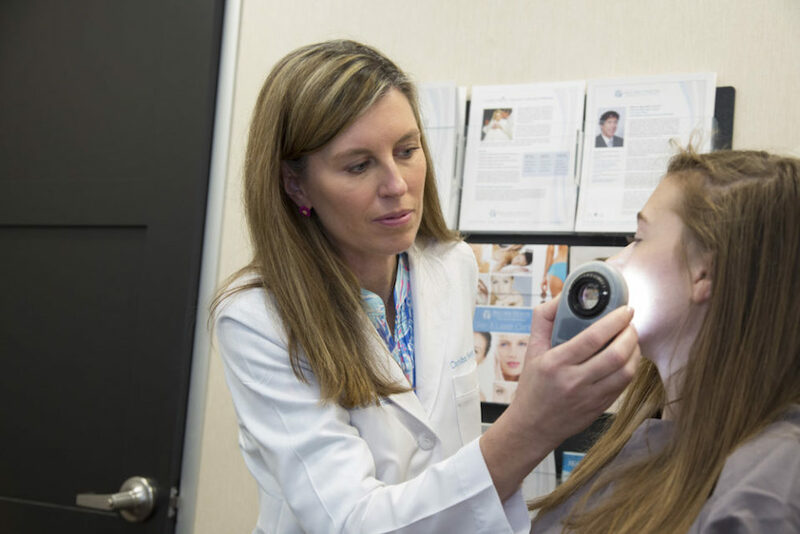 It is up to you to ask a few questions and make sure you are scheduling an appointment with a dermatologist who meets the Gold Standard of skin screening. This is no time to be shy! The dermatologist will put you into a gown and do a full body check for moles and any lesions. That includes the feet, nails, head and genital areas. Make sure the dermatologist uses dermatoscopy. It is a scoping technique that uses skin surface microscopy. It can also be called epiluminoscopy and epiluminescent microscopy. It allows the dermatologist to look into the layers, color patterns and changes deep within the mole, rather than just glancing at the surface. If anything atypical is found, the dermatologist will determine if it should be removed for biopsy or if it should be watched. The appropriate time period for “watching” is three months. Many dermatologists will photograph moles they want to keep an eye on to best detect any change. Still others may recommend “mole-mapping” technology in families at high risk for the disease. This involves full body photography, but is relatively new. Listed below are the amazing ‘Gold Standard” dermatologists in Maryland who dedicate their time and expertise to the Claire Marie Free Screening Program and meet the highest standards of care. All are listed in alphabetical order. Many are part of the renown teams at Johns Hopkins Dermatology, Simmons-O’Brien & Orlinsky, Belcara Health, Maryland Dermatology, Skin & Vein and University of Maryland Upper Chesapeake Hospital. Dr. Margaret Weiss, M.D., F.A.A.D. Dr. Robert Weiss, M.D., F.A.A.D. I got a call last week. The voice was unfamiliar, but the anxiety and frustration was well known to my heart. It was a mom who just found out her 14 year old daughter had melanoma; a stranger calling from California, frightened and frustrated about the lack of information offered by her daughter’s dermatologist. An in situ melanoma was found in a mole her daughter had since birth. It was on an area of her breast that always well covered. Her daughter never tanned. The mole didn’t even look unusual! How could this happen? I told her that “surprise” factor was the nature of adolescent melanoma and her story was all too familiar. Melanoma in young people simply is not the same as adult melanoma which is why it is so often missed or misdiagnosed in young people. Fortunately, they found it quite early on her daughter and follow-up surgery was already scheduled. 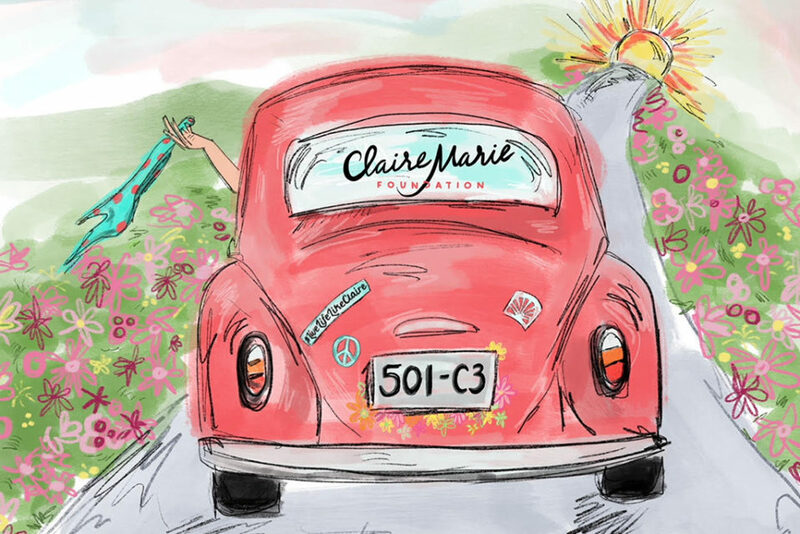 This California mom shared that she was thrilled to find The Claire Marie Foundation website, our research and possibly some answers about her daughter’s melanoma; the disease the medical professionals ignorantly believed her daughter was too young to get. Calls such as this validates the mission of the Claire Marie Foundation. We wish someone had been there to warn us about the risk of melanoma in adolescents, children and young adults. We wish someone would have compiled and shared the warning signs and the nuances of detection. We especially wish we had faster access to removal of any and all atypical moles since melanoma grows faster and is more invasive in young people. It takes more than sunscreen to stop this form of melanoma. Routine screening and early detection is the key, but getting a dermatological appointment can be the problem with an average wait time of three months. Thats why the Claire Marie Foundation partners with top dermatologists to offer free skin screenings to young people. In 2017, we hosted four free screening events in April and May to anyone between the ages of 8-21 years old. Of the nearly 300 young people screened, 10% were found to have atypical moles with biopsy recommended for suspicion of melanoma. Happily, that is a decrease from our 2016 screenings, were dermatologists found 20% of the 120 young people screened had atypical moles with biopsy recommended. These figures prove our awareness and prevention programs are working. Knowing melanoma can develop genetically or due to hormonal changes in puberty and pregnancy, screening is the best way to catch the disease before it develops – when a mole is just atypical or beginning to change. Remove the mole – remove the risk. Equally important is the need to maintain a healthy, sun-safe, preventive lifestyle! Ditch the tanning booths, keep slathering on the sunscreen and invest in some UPF50 clothing. Do it all with style and a smile, and #LiveLifeLikeClaire! Our CMF Arts & Design Scholarship Winner UVA Bound! We are so excited and proud to announce that Elizabeth Liberatore is the 2017 Recipient of the Claire Marie Foundation Scholarship for Arts & Design! 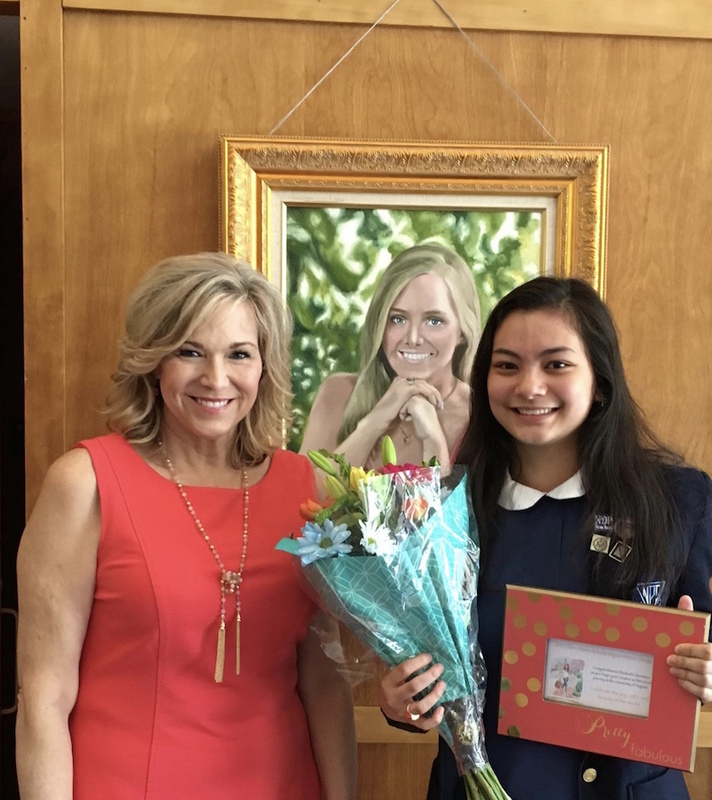 A Senior at Notre Dame Preparatory School, Liz is off to University of Virginia in the fall to study architecture and bring some joy, color and beauty to the world in her own way! We can’t wait to see her amazing creations! Special thanks to all of the fantastic design professionals who donated their time and expertise in judging our applicants: Katie Fico of Disney Animation Studios, Danielle DiFerdinando of Danielle Nicole Designs, Maryland’s First Lady – Mrs. Yumi Hogan – artist and MICA educator, L.A. based Interior Designer Stacey Vuduris , Illustrator Inslee Haynes of Design by Inslee and stage lighting and set designer, Tim Swiss. Claire wrote those words in her college application essay. It was a whispered thought, a mantra used to propel her through the toughest days. 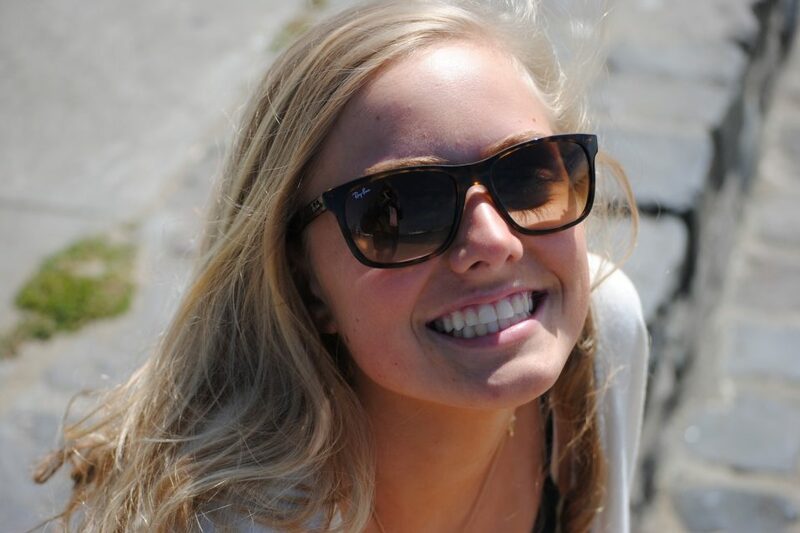 Little did she know those few words strung together would offer great inspiration to so many people who knew her; especially her friends as they face the emerging challenges that come with college, life and the professional world. Now, we are blessed and so proud to see how they carry Claire’s exuberance and strength with them onto their college and university campuses as CMF Collegiate Ambassadors. Newly launched in April of 2017, our Collegiate Ambassador program boasts 55 representatives on 22 campuses nationwide sharing peer-to-peer awareness and education programs about melanoma in adolescents and young adults. It is the second most common cancer in young people and the number one cause of cancer death in women between the ages of 25 and 30. By offering a presence at campus activities such as wellness fairs or speaking to small and large groups such as athletic teams or Greek organizations, CMF Ambassadors work hard to raise awareness of the prevalence of adolescent and young adult melanoma and just as importantly, the best way to prevent it. Our Ambassadors do this all with style, creativity and the ever-present splash of ‘Claire Coral’. In just our first eight weeks, they managed to reach some 1600 students. Amazing! As we say, #AwarenessSavesLives! 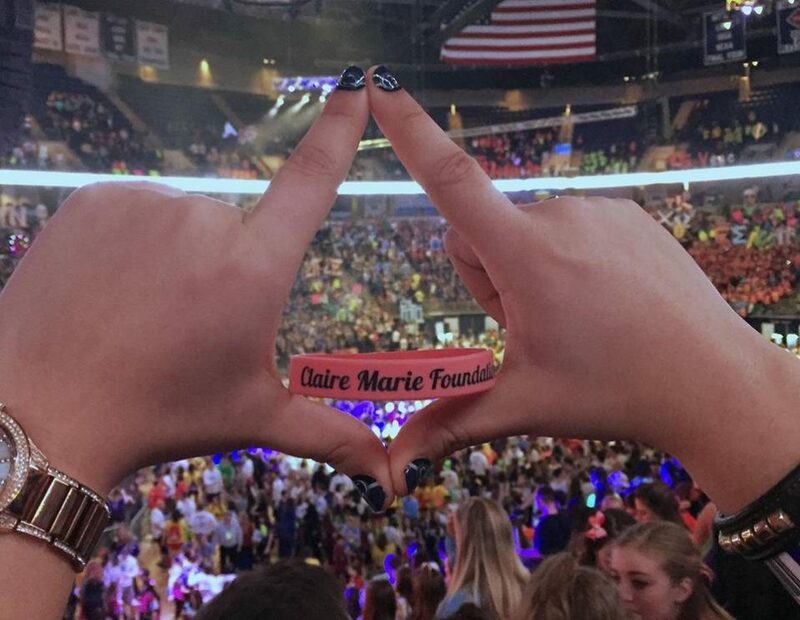 If you are a college or university student and are interested in becoming a Claire Marie Foundation Collegiate Ambassador, let us know!